The third edition of Chemistry continues the substantial commitment of Wiley to chemistry education in Australia and New Zealand, as well as for international markets. Chemistry 3e provides the appropriate mix of organic, inorganic and physical chemistry for the 2-semester introductory chemistry course. 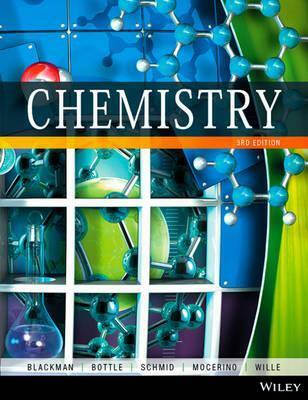 In this edition all chapters have been revised, with selected chapter openers and examples being updated to reflect the latest developments in the field of chemistry. New worked examples, practice exercises and end of chapter questions have been added throughout, and many of the existing questions have been reworked with new values. Allan Blackman is a Professor at the Auckland University of Technology in Auckland, New Zealand. He obtained his BSc(Hons) and PhD degrees from the University of Otago, New Zealand. He has taught all levels of undergraduate chemistry, in the areas of inorganic and physical chemistry, for over 24 years. Allan's research interests lie mainly in the field of coordination chemistry, where he studies the synthesis, structure and reactivity of coordination complexes. He has spent research periods in the US (Indiana University, the University of Minnesota), Australia (the University of Queensland) and France (Universite Joseph Fourier, Grenoble), and has also given numerous undergraduate lectures at the National University of Defense Technology, Changsha, China, where he has been appointed a Guest Professor. Allan regularly appears on TV as a science commentator, and published a monthly newspaper column concerning all things chemical. Outside science, his interests include music and sport. Professor Steven Bottle is a graduate of the University of Queensland where he completed Honours in Organic Chemistry. After working in various jobs in the pharmaceutical and mining industries, he subsequently undertook a PhD at Griffith University in collaboration with the CSIRO. On completion of his PhD he was awarded an Alexander von Humboldt Fellowship before taking up an academic position at QUT, where he has risen to the rank of full professor and is currently the Science and Engineering Faculty's Director of Research (Quality). Steven is a teaching and research academic with an established reputation for excellence in both pure and applied research, matched with demonstrated teaching capabilities and professional expertise. He has a reputation for inventive and pioneering research and has achieved international recognition for his expertise in the chemistry and applications of free radicals, especially in the context of antioxidant drugs and novel materials. Steven's particular interests include the use of stable nitroxide free radicals in synthesis, polymers and other materials as analytical tools and antioxidant drugs. Stable nitroxide free radicals play critical roles as additives (protecting coatings and plastics), as tools to make new materials and even as new antioxidant medicines. Steven has led much of the modern research on discovering new forms of nitroxide free radicals and applying them in a range of contexts, including as medicinally active compounds, detectors of free radical damage in materials and monitors of particulate pollution that impacts on human health. Associate Professor Siegbert Schmid obtained his PhD and Habilitation from the University of Tubingen, Germany, and subsequently accepted a position at the School of Chemistry at the University of Sydney. His research interests lie in the synthesis and structural characterisation of aperiodic and other materials with potential technological applications (e.g. insertion materials for rechargeable batteries). In addition, he is active in chemistry education research and has supervised a number of PhD and Honours students in this area. Siegbert's education research aims to improve current teaching practices and learning outcomes for tertiary level students. He is a Past Chair of the RACI Division of Chemistry Education. His teaching has been recognised with a number of teaching awards, including the Vice Chancellor's Award for Outstanding Teaching (the University of Sydney 2012) and an Office of Learning and Teaching Citation Award (2012) for Excellence in Teaching. Associate Professor Mauro Mocerino has enjoyed teaching chemistry at Curtin University for over two decades. During this time he has sought to better understand how students learn chemistry and what can be done to improve their learning. This has developed into a significant component of his research efforts. He also has a strong interest in enhancing the learning in laboratory classes and led the development of a professional development program for those who teach in laboratories. Mauro's other research interests are in the design and synthesis of molecules for specific intermolecular interactions including drug-protein interactions, host-guest interactions, crystal growth modification and corrosion inhibition. He has received numerous awards for his contributions to learning and teaching, including the inaugural Premier's Prize for Excellence in Science Teaching: Tertiary (2003), the Royal Australian Chemical Institute, Division of Chemical Education Medal (2012) and an Office of Learning and Teaching Australian Award for Programs that Enhance Student Learning (2013). Uta Wille is a member of the School of Chemistry at the University of Melbourne. She has studied chemistry at the University of Kiel in Germany, where she graduated with a PhD in physical chemistry and afterwards completed a Habilitation in organic chemistry. Uta moved to Australia in 2003 to take up an academic position in the School of Chemistry at Melbourne University. Her research interests lie in the area of physical organic chemistry, environmental free radicals and reaction mechanisms, and she is particularly interested in how environmental radical and non-radical oxidants damage biological and manufactured materials exposed to the atmosphere. Uta teaches chemistry at both undergraduate and graduate levels and enjoys sharing her fascination and passion for chemistry with university students. She is currently Chair of the Academic Programs Committee of the School of Chemistry, Melbourne University.